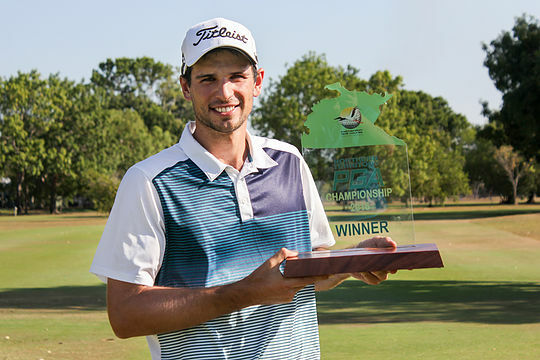 Jordan Zunic has held off nerves and blustery conditions to take out the inaugural Northern Territory PGA Championship at Darwin’s Palmerston Golf Club. Following on from an opening 7-under 64 in the opening round, Zunic recorded a wire-to-wire victory for his second PGA Tour of Australasian win, after bursting on to the professional scene with his mercurial NZ Open triumph in early 2015. And the emotions certainly got the better of the 24-year old as he thanked family and supporters in his victory speech in front of an appreciative Palmerston gallery. “I can’t describe how I am feeling; it’s absolutely amazing, it’s really want I wanted to do from the start of the week.” Zunic said. Zunic entered the tournament among the favourites for the championship but certainly never had the opportunity to feel comfortable despite holding the lead on each day. A five-stroke lead at the halfway mark was reduced to two with a round to play, with Zunic’s most serious challengers coming from Queensland’s Tim Hart, the ACT’s Matthew Millar and in-form South Australian Max McCardle. A nervous pull hook into the trees with an iron at the driveable 1st hole kicked fortuitously back into play, allowing Zunic to salvage a par and settle the nerves. From then on, Zunic stuck to his game plan that treasured playing from the short grass and always looked to have the field at arm’s length as his contenders experienced mixed fortunes around the tricky layout. Consecutive bogeys at the 11th and 12th shaved his lead to a stroke, however a masterly 4-iron at the difficult par-three 14th turned the tide and with another at the 15th gave him some breathing space over the closing holes. McCardle made life interesting with a birdie at the 71st hole to reach 11-under but shaved the hole with a birdie attempt to miss posting a 12-under total at the final hole. Hart was still an outside chance playing the final hole but a blocked drive resulted in a pitch out and a bogey to finish in third place at 10-under. Hart’s predicament made life a little more comfortable for Zunic who was able to two-putt from long range for a par at the last for a 13-under par total and a two-stroke victory. Zunic’s victory was an obvious shot in the arm for his confidence as he sets his sights on a number of events overseas and a tilt at the European Tour Qualifying School at the end of the year. More importantly, the manner of this victory unlike his first in New Zealand, was another key learning experience in his young career moving forward. The ISPS HANDA PGA Tour of Australasia travels next to New Caledonia for the South Pacific Open Championship, to be played at Tina Golf Club in Noumea from 21-24 September.